Dr. Rife was the second conductor of the RVSB, from 1998-2001.Dr. 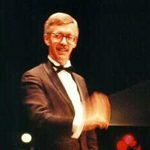 Jerry Rife directed the Raritan Valley Symphonic Band from September 1998 to June 2001. Dr Rife is Professor of Music and Chair of the Music Area at Rider University in Lawrenceville, New Jersey, where he teaches music history classes and conducts instrumental ensembles. In 1990 he received the Lindback Award for Excellence in Teaching. Dr. Rife was associate producer and director of musical research for “If you knew Sousa,” a 1992 documentary film on Sousa filmed for The American Experience and shown world-wide on the PBS television network. He is extremely active as a performer of solo, recital, orchestral, and jazz music on the East Coast on clarinet and saxophone. He has guest conducted and adjudicated at band festivals, published numerous articles on band music and on the works of French Composer Florent Schmitt, is a respected lecturer in the community, and is New Jersey state chairman of the College Band Directors’ National Conference. In addition to his leadership of the Raritan Valley Symphonic Band, he also conducts the Rider University Concert Band and the Blawenburg (NJ) Band. Dr. Rife received the Bachelor of Science in Music Education and Master of Music in Applied Clarinet Performance from Kansas State University, where he studied Clarinet with Frank Sidorfsky. He also studied with Fred Ormand of Michigan State University, George Silfies of the Saint Louis Symphony, and Clark Brodie of the Chicago Symphony. He received he Ph. D. degree in Musicology from Michigan State University, where he studied Musicology with Dale Bonge, Hans Nathan, and Rosalie Schellhous. His research areas included the life and music of Florent Schmitt, Igor Stravinsky, John Philip Sousa, and Carl Nielsen. He also studied improvisation as creative expression and single reed instrumental acoustics.